Eugene Byrne: this article has also appeared in Bristol Times in the Bristol Evening Post. Bristol's Whitchurch Aerodrome (nowadays Hengrove Park) was the site of a couple of major advances in women's rights. This was where a group of determined and resourceful women won the right to fly military aircraft alongside the menfolk, and at the same rate of pay as the men. This was very probably the first time in British history that women won the right to equal pay. Many people will have heard of famous women flyers like Amy Johnson, or America's Amelia Earhart, but what’s less well appreciated is that they were only two among many. Many early aviation pioneers were women. In the 1920s and 30s, several women set new flying records, many of them British. Amy Johnson, Beryl Markham and Jean Batten ("the Garbo of the skies") were household names. Many others were less well-known, women bitten by the flying bug and determined to keep themselves airborne. Some formed aerial survey and photography companies. Others ran modest airlines or air-taxi services, or offered joyrides to holidaymakers at seaside resorts during the summer season. By their nature, they tended to be pretty strong characters, so when war broke out many were determined to do their bit by doing what they did best – flying. Pauline Gower was one. Her Conservative MP father was appalled at the idea of his teenage daughter learning to fly, so she gave music lessons to finance training for her pilot’s licence. He later relented, became her staunchest supporter and bought her an aeroplane. For much of the 1930s she and her friend and fellow pilot Dorothy Spicer ran a small aviation business. 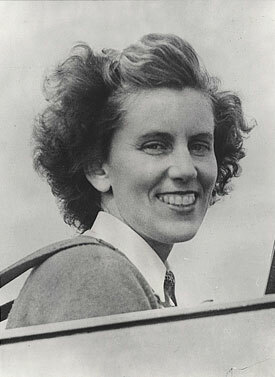 When war broke out, Pauline Gower pestered the Ministry of Aviation for permission to recruit women flyers. She got the go-ahead, and on December 16 1939 she held a meeting at Whitchurch, inviting 12 women pilots for lunch and a flight test. And so was born the women's section of the Air Transport Auxiliary (ATA). The ATA ferried aircraft between factories, repair shops and RAF airfields to free up air force pilots. Many of the ATA's male pilots were unfit for front-line duties due to age or disability. Now the ‘Ancient and Tattered Airmen’ were joined by women who were often more experienced and able pilots. The women flew all types of aircraft, from light trainers to four-engine bombers, from airfields all over the UK. There was a large ATA depot at Whitchurch because of the busy wartime aircraft industries in the region, including BAC at Filton, Westland at Yeovil, and Gloster Aircraft at Brockworth. Some of the first pilots to fly Britain’s first jet fighter, the Gloster Meteor, were the women of the ATA. In all there were 166 ‘Atagirls’, including volunteers from Canada, New Zealand, the USA, Poland, South Africa, the Netherlands and Chile. Fifteen lost their lives, including Amy Johnson. It was dangerous work; they flew unarmed, usually without radio, often without fully functioning navigation instruments. Accidents were common, and an unlucky encounter with a German fighter was usually fatal. There were close links between the ATA and BOAC, the government-owned civil airline set up in 1939 on the merger of British Airways Ltd and Imperial Airways. Many of both companies’ aircraft were moved to Whitchurch in 1939 and it was Britain’s only civil airport during the War, running services to Lisbon, Gibraltar and Shannon. The latter provided a link to the United States, and visiting celebrities, as well as diplomats and spies, arrived in Britain via Whitchurch, including Bob Hope and Bing Crosby. Pauline Gower was appointed a director of BOAC in 1943, having successfully lobbied for women pilots to be paid the same rates as the men. She later married RAF Wing Commander William Fahie; her ATA rank technically was equal to his. Tragically, she died in 1947 shortly after giving birth to twin boys. She flew a Spitfire under the Suspension Bridge – twice! Ann Wood-Kelly came from a wealthy American family and was a keen flyer. Desperate for adventure, she took a ship from Montreal to Liverpool in 1942 to join the ATA. She is probably also the only woman to have flown a plane under the Clifton Suspension Bridge – twice. The first time, she was flying a Spitfire, accompanying two others piloted by men. They flew under the Bridge, so she simply followed them. She later did it again, alone this time, although there was much less room because the river was at high tide. Elsie Davison was one of the first women to join the ATA, but was killed at RAF Upavon in Wiltshire. The probably cause was carbon monoxide poisoning, causing them to pass out and the plane to crash. Her sister organised her cremation at Arnos Vale, and her ashes were later scattered from an aircraft. Her name is on one of the memorial stones to the war dead at Arnos Vale. Read the Arnos Vale press release issued to mark the 70th anniversary of Elsie Davison's death. She was the first of five servicewoman to be commemorated at the cemetery. 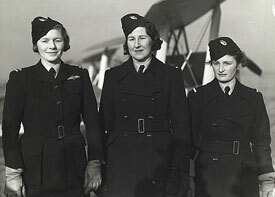 Three of the first of eight women pilots to join the ATA in January 1940: Pauline Gower, Winifred Crossley and Margaret Cunnison. 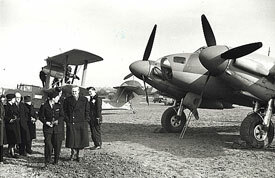 Sir Stafford Cripps visits White Waltham Airfield, Head Quarters of Air Transport Auxiliary. Behind on the left is Pauline Gower. 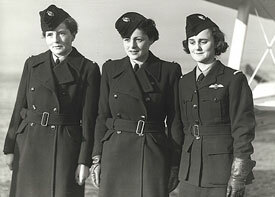 Female ATA ferry pilots: Honourable Mrs Fairweather, Mona Friedlander and Joan Hughes. 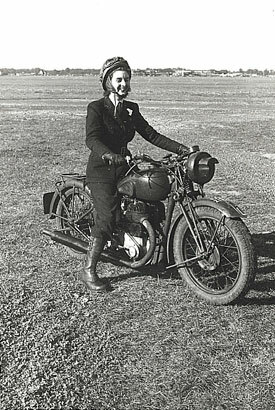 Female despatch rider wearing Air Transport Auxiliary uniform. ATA pilot Lettice Curtis pictured in a Spitfire just after WW2. 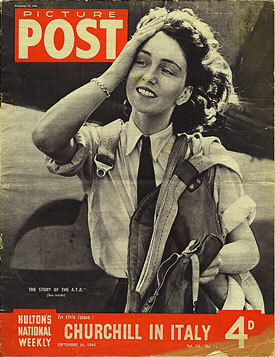 ATA First Officer Maureen Dunlop on the cover of the September 1944 edition of 'Picture Post'. The above photographs are all taken from Aviation Archive.